Andrew Bird, the MD of Crowe Horwath Risk Consulting UK and Marjella Alma, the CEO of Datamaran explain Emerging Issues and how a dramatic business response and game changing technology solution can create value. Emerging Issues – what is driving this agenda and why do companies need to pay attention? Understanding risks and issues should be an inherent part of running any business successfully. Traditionally, focus has tended to be on a narrow selection of risk types and risk management is often isolated and segregated from day-to-day operations. In my 30 years’ experience in this area, the biggest challenge for any serious risk function is to take it from ‘chore’ to ‘core’. This means making management of Emerging Issues absolutely fundamental to the way business gets done. Emerging Issues – not only the risks to the business inherent in its model and operations, but also the risks of the business from an environmental and social perspective – are increasingly subject to scrutiny and demands for transparency. Such risks can no longer be swept under the carpet. When done properly, being aware of and efficiently managing Emerging Issues generates competitive advantage and tangible value. The world is changing at a pace we have never experienced before and increasingly there is pressure to be more responsible beyond the P&L. Markets are changing, workforces are changing – and we believe that firms need to keep in step with that change. Any firm falling behind now will find that it will be difficult to regain lost ground. A study by the World Economic Forum shows more than 25% of a company’s market value is directly attributable to its reputation. Historically, many companies chose not to disclose the Emerging Issues which could influence their reputation and harm their strategic growth. I ask companies on a daily basis how they track, measure and mitigate the impact of ESG risk and Emerging Issues across their business. How do they decide what represents responsible investment? Can they ensure full transparency and accurate disclosure to regulators? How do they benchmark the competitive landscape? These are key questions that need to be answered before any strategic decisions are made. We have seen how quickly the changing landscape of public opinion can have an immediate and lasting impact on reputation and perception. Research shows that 90% of consumers would boycott a company if they learned of irresponsible or deceptive business practices (2015 Cone Communications/Ebiquity Global CSR Study). 71% of consumers said they would be willing to pay more for a socially or environmentally responsible product; 62% of respondents would prefer to work for a socially responsible company, even at lower salary levels. This has an impact on the ability of a company to continue to do business effectively. Why is it important to identify and ensure Emerging Issues are on the radar of companies? 2017 will be the first reporting year for the EU Non-Financial Reporting Directive (which requires companies with >500 employees to report on non-financial (Emerging Issues) performance and risks. This will impact c.6,000 companies which have not voluntarily reported to date. Inclusion of ESG and Emerging Issues management and disclosure will become an imperative for business. But how do companies recognize Emerging Issues and their potential impact across all layers of their business? We have identified 100+ Emerging Issues that can impact the ability of companies to operate efficiently in line with regulatory and legislative requirements across geographies and sectors. Our list evolves as new issues are identified with key headline issues of climate change, executive compensation, board competence, IP infringement, responsible procurement, human rights and more. The value to be derived from addressing these Issues can include greater efficiency, less waste, effective reputation management, positive company ethos and transparent governance. To minimize risk, real-time quality analytics across Emerging Issues is crucial, as well as the capability to address Issues as they arise. What does the future hold? Further technological innovation or disruption? We are in a new world driven by technology. The ability to use this technology in the right way and to analyse the right information means that companies can know what matters most, plan strategies and make decisions based on validated facts. Data-driven decision making is the future. Forward-thinking companies are beginning to react to this disruptive technology and recognise that anticipation of Emerging Issues and proactively addressing them will help increase the lifespan of their business. Within the financial services sector, technological innovation (FinTech) continues to transform the industry, disrupting every business segment in its path. New players are emerging with more nimble, agile services that operate service models which are more in-sync with the aspirations of their target customers. Increasingly technological capabilities enable firms to analyse data, see patterns and predict behaviours with far more accuracy, detail, consistency and precision than ever before. We are now witnessing a new dawn with the emergence of a new disruption, RegTech, the combination of regulation and technology. Machine learning and artificial intelligence will radically change the way companies use analytical tools to analyse and structure Big Data including for regulatory and compliance reporting demands. Our ability to take data and ultimately convert it into knowledge and clear decision making has caught up. And so we needed to look at our own traditional models differently. By exploiting sophisticated technology backed up with experienced risk management, we are changing the way companies identify, assess, continuously monitor and mitigate Emerging Issues. The benefit of this approach is a fully integrated, sustainable solution which will deliver strategic growth, enhance reputation and mitigate risks facing a business. How are you embedding this convergence of data and risk into companies? In over 10 years at the Global Reporting Initiative, working in the area of sustainability and ESG, I realised that technology was the key to delivering genuinely “insightful information” using the huge quantities of data available. I believed that technology would be a game changer and that, by manipulating this explosion of available data into structured knowledge, it would both inform and help companies make better decisions and demonstrate how addressing emerging risks could be a direct contributor to value creation. This has always been my aspiration. 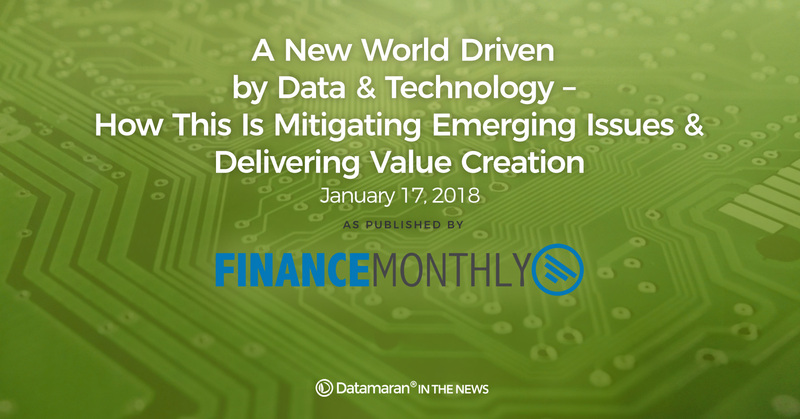 Datamaran's data analytics platform extracts Big Data from a variety of sources across all Emerging Issues. This combination of machine-learning and artificial intelligence means real-time identification of connections between various sets of data. The ability to use analytical tools to identify gaps, address trends and leverage Big Data in a meaningful way improves monitoring of strategic issues, ensures transparency across corporate reporting, mitigates potential costs arising from non-compliance and overall, improves company performance. Looking at ‘risk management’ through the lens of ‘value creation’ is a much more effective means of taking the principles of sound business management to the heart of the business. To achieve this, companies need the reporting tools and analytical data at hand to provide all stakeholders – from shareholder to regulator – with the material focus and consistency of evidence that they require. The controls around current environmental issues and processes around management and reporting can sometimes be ambiguous, often characterized by what I call ‘peacock reporting’ – pages of overblown information. Knowledge is key. We have a unique offering, Crowe Risk, powered by DatamaranTM , which empowers stakeholders of any company (management, shareholders, investors, employees, customers, suppliers) to understand, visualise and manage these issues, maximise opportunities and create tangible value. It is taking the application of data and risk to new levels. In effect, we help clients turn data into knowledge – and that is immensely powerful. In most cases, it is a genuine game changer.